If English-language liturgical singing was once in its infancy in our parishes, it now finds itself at the beginning of all the insecurity and promise of adolescence. English speakers can now “sing praises with understanding,” making use of an ever-growing collection of vernacular service books. It has been proven: Orthodox liturgy can be done in English. Yet there are some, perhaps many, who still say: “but it just sounds better in Russian.” And half the time they are right. What is it that gives the best of Russian/Slavonic church music its tremendous power? Part of the answer lies in the clothing of the sacred written text in a musical garment so perfectly tailored that it becomes transparent, inseparable from the text. The best hymnographers of the Church, inspired by the Spirit, have often been poets as well as church singers. They multiplied the divine gifts given them by spending long years absorbing the Scriptures, the services, the chants of the Church. Thus, the works that they themselves produced were not innovative, self-conscious, or revolutionary, but new expressions of the same unchanging tradition of Life. For Orthodoxy to express itself in English in all the fullness of its life-changing power requires that we English speakers begin to trod the same path as the hymnographers of old. We need men and women who have a deep grounding in the life of the Church, particularly its hymnography, and who in addition have long familiarity with the English musical and poetic tradition. Such people have never been common but, fortunately for us, Fr. George Johnson is one of them. Having served a long and exacting apprenticeship in both academic and Anglican church circles, he also has an innate sensitivity to beauty that no education could have provided. Fr. George was the English choir director and then assistant priest at St. John the Baptist Cathedral in Washington, D.C., from 1986 until 2001. Then he was among the founders of Holy Apostles Orthodox Church in Beltsville, Maryland, and is the rector of this mission parish. He has made his own the living tradition of the Russian Orthodox Church. He has sought out some of the best examples of the Russian musical tradition as the basis for his English settings. Word placement is informed, not just by his superb musical/linguistic intuition, but by a developed theory of textual articulation (outlined in the first part of his work in progress, A Church Singer's Companion). The end result? His work sounds like English – and like genuine Orthodox church music. “The hand of the giver will not be empty” says the Russian proverb. If we do not have the gifts of a translator or composer, we can support those who do. In a previous age, Fr. George's work would have been given the patronage and financial support of the Tsar himself (as was given to Miss Hapgood and Fr. Orloff). Support nowadays must come from other sources. A donation to the St. Romanos the Melodist Society can help support Fr. George’s music work, to allow him to do this work for which he is so uniquely qualified. To do so is to call down upon ourselves God's mercy, Who richly blesses those who love the beauty of His house. Please make a donation to support the work of Fr. George and the St. Romanos the Melodist Society. The work of the Society, which is a sodality of Holy Apostles Orthodox Church, is now being offered to support the missionary work of Holy Apostles in Beltsville, Maryland. (www.HolyApostlesOrthodoxChurch.org) The little mission church is working on establishing a permanent church home for their parish. The parish has recently been given a wondrous gift: a beautiful historic church on two acres of land in Beltsville. 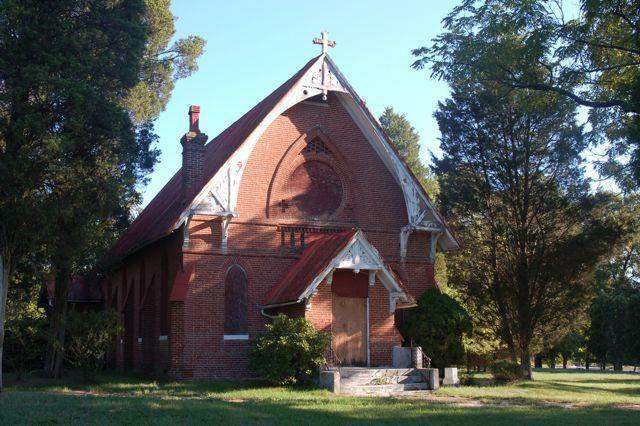 Before the parish can occupy the new church they must restore and renovate it, and build a parish hall. The project cost of this will be about three million dollars. In the meanwhile, they are meeting in the Twin Chimneys Office Park in Beltsville, Maryland. Thank you for your prayerful support of this missionary endeavour. Vladimir Morosan, founder of Musica Russica and the editor of "Monuments of Russian Sacred Music," has served the Church for over 25 years as a choir director, arranger, publisher, and workshop leader. The principle of singing divine services in the language of the local nation or culture has always stood at the center of Orthodox worship and missionary efforts. How else are we to fulfill the psalmist's admonition to "Sing praises with understanding"? Yet, in American Orthodoxy, this ideal has not always been easy to fulfill, especially in congregations with strong ties to a particular ethnic emigre community. In the midst of established ethnic musical "traditions" and repertories (some of dubious authenticity and quality), fledgling attempts to sing in English have been hampered by such factors as inadequate and inelegant translations, amateurish musical adaptations, and deficient musical notation. The effect has been especially adverse upon the musical rendering of liturgical elements heavily dependent upon the text-stichera, troparia, kondakia-sung to the Eight Tones: uninformed singers struggling to improvise unfamiliar tonal patterns in ambiguously notated harmonies. Consequently, all too often the verdict upon singing Orthodox services in English has been: "It just doesn't sound as good as it does in _____________ (fill in appropriate Old-World tongue)!" It is for this reason that the appearance of A Church Singer's Companion, Volume I: Vespers, compiled and edited by Priest George Johnson, (Washington, D.C.: St. John the Baptist Russian Orthodox Cathedral and The Brotherhood of St. John Maximovich, 1998) is a particularly welcome phenomenon upon the American Orthodox musical scene. Using the Church Slavonic Sputnik Psalomshchika (A Psalm Singer's Companion) and similar anthologies as a point of departure, this collection sets forth, in systematic fashion, at least one and in some cases two versions of each fixed and variable element of Resurrectional Vespers, arranged in four-part harmony. Future volumes are planned for the elements of Matins, Divine Liturgy, and the Lenten, Paschal, and Festal cycles. The melodies represent "the general practice found among the parishes of the Russian Orthodox Church Outside Russia (ROCOR)" and the texts employed are also drawn from liturgical publications endorsed by ROCOR. The publication is beautifully typeset using the top-of-the-line Finale® music notation software by Coda Music Technologies. While there are various other materials currently available in English for the Vesper service, Fr. George's collection stands out in a number of ways. First and foremost is its concern for tradition and accuracy, listing all sources and giving accurate attributions of the various chants used. It reflects thorough planning and preparation on the part of the editor and extensive field testing with the English choir at St. John's Cathedral. Although space constraints limited the number of variants that could be included for some of the fixed elements of the service, those that were chosen were selected for their melodic, chant-based content. As a tradeoff, the variable sets of stichera (with their psalm verses) and troparia according to the Eight Tones are completely supplied with musical notation-truly a boon to those coming into contact with this material for the first time. Most importantly, the relationship of the texts to the melodies reflects a keen sensitivity for the rhythm and flow of the English language on the editor's part-something that is all too often lacking in existing adaptations of English liturgical music. Finally, almost as valuable as the musical text is the editor's thoughtful and highly educational introduction, in which certain aspects of singing according to the Russian system of tones are addressed for the first time in any English publication. Although the editor emphasizes that this collection "represents just one example of general practice," this particular effort stands out as a guiding light for similar undertakings. Let us wish Fr. George Johnson and his volunteer team of collaborators swift progress on the remaining volumes and offer them the support and encouragement they have richly earned by this initiative, recognizing that in other times and contexts, such undertakings were endowed by national Churches and government treasuries.